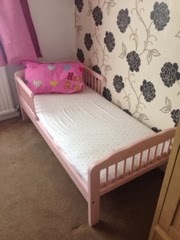 So last weekend this happened...hubby put Bubba's big girl bed together. This weekend was originally going to be d-day on the potty front, we were planning to get that sorted over the next week. Unfortunately Bubba had other ideas and as I had gently tried to persuade her on the Thursday night and also Friday night to try having a wee in the potty and that at the weekend we'd do the whole deal but she cried at the thought of not wearing a nappy, cried and called the potty "scary" so we quickly aborted the idea of even trying. I know my girl and if she wants to do something she usually wants to do it straight away and full gusto, this wasn't going to plan. Luckily (not for me) it was good we decided not to go ahead because I got ill and spent most of Saturday in bed and moaning (because I couldn't take anything stronger than paracetamol). 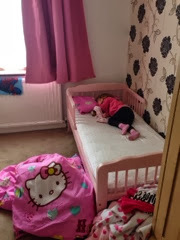 Anyway we had got her a big girl bed with the idea we would set it up in a few weeks once potty training was cracked but instead we decided to go go go on the bed front. 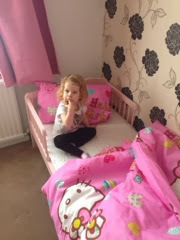 Hubby set up the bed and Bubba enjoyed bouncing on her new bed. I wasn't too sure she would end up sleeping in it. We left the cotbed up in her room just in case. At bedtime, in her brand new jammies, daddy put her into bed and I expected the usually three or four minutes of moaning but nothing. She was asleep faster than normal, it's slightly disconcerting as I had expected tears, a bit of a refusal to accept the changes but what I got was silence (or rather a soft snoring). Monday morning when she woke up, daddy went to get her and found her by the foot of the bed on the floor. She had fallen or rolled out and along. We didn't wake and neither did she, there was a spare duvet on the floor to soften the fall. I was a bit worried about her nap time sleep the most because this is the one she sometimes resists. I shouldn't have worried today because although she talked to herself for about 15 minutes, she didn't get out or fall out. I picked her up and put her in the bed and left the room and that was it. Bedtime she went down fine and again was asleep in minutes compared to recently where she would cry for five minutes or so before giving in. She did say 'me gets out' but I said if she needed us she just had to call and we would come and get her. I'm hoping she may not realise she can get out but I think I'm kidding myself. 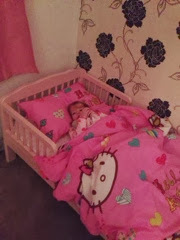 So that's it, we are on our way with sleeping in a big girl bed. It'll probably get interesting when she realises that getting out is an option but until then I'll bask in the glory that my girl is growing up and loves her new bed.